It looks like Iker Casillas’ 25-year association with Real Madrid is finally on the verge of coming to an end, with MARCA reporting that Porto have reached an agreement to pluck the 34-year-old goalkeeper from the only footballing bosom he’s even known. According to MARCA’s latest update, Porto have “closed a deal” to release Casillas from his Real Madrid contract with the three parties now keen to rush the transfer through before the Spanish side disappear to Australia on their pre-season tour on July 12th. 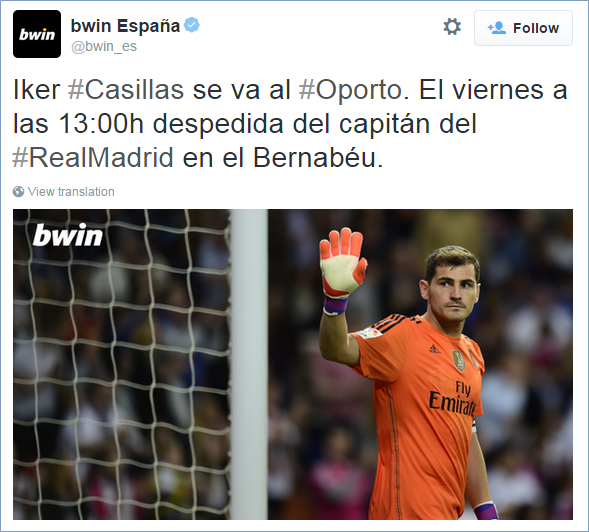 No official word has been emitted by either camp as yet, but thankfully Real’s official betting partners, Bwin, went and announced (prematurely) on Twitter that the club are planning to hold a farewell ceremony for Casillas at the Bernabeu on Friday afternoon. Well that escalated quickly. The end of an era, confirmed in a half-arsed Tweet. And can you think of a more fitting way to bid farewell to a legendary servant than a quick wave-off at one o’clock on a Friday afternoon? This is funny, according to Portuguese papers this deal could be going sideways due to Iker just finding out that the Portuguese tax system is different resulting in him earning less income on after-tax dollars as Portugal doesn’t provide a discount to players. 20% in Spain, vs. 56.2% for higher income earners in Portugal. In short, he now may not want to sign the contract with Porto leaving Real trying to figure out a way around this.